Although the process is not for the faint of heart, it is one that I believe is responsible for my life unfolding like the wings of a butterfly as she exits her cocoon. Without even realizing it, I had been protecting myself from past hurts. And still denying myself the fullness of the love in front of me. With an overabundance of grace and compassion and love, Sherry held my hand as I looked at the truths of the past in a way that allowed me to forgive and to finally let go. I am already seeing the effects of our work together. The self-confidence and worthiness that I was stripped of so long ago are being restored. And all because Sherry created a safe environment for me to process and ask questions and speak my truth in a way that I had not been able to before. What is the best thing you learned or gained from working with me? The best thing I gained was seeing the patterns I was repeating from my parents, which I believe allowed me to heal my past as well as stop the patterns from being passed down to another generation. How will you apply it or How will it change &/or improve your life? Being able to process the grief and the pain is going to allow me to live my life in a much fuller and more vibrant way. It is going to allow me to love and nurture myself in the most beautiful of ways. On a personal note, how did I as your coach make you feel during the process/our time together? You made me feel safe and protected. Heard. Valued. Understood. Describe how things were feeling and going for you before we started working together? I was carrying a massive amount of grief from the death of 3 family members and a massive break-up with a long term boyfriend. I didn’t know where to go from there in an emotional sense which I found also affected my physical health and well-being as well. I dragged myself to and from work and School and found my motivation and usual zest for life was nowhere to be found. At the time, I didn’t know what kind of help I was seeking, but Sherry came into my life at coincidentally the most perfect time. What happened for you during the process? Sherry made me address things inside me I wasn’t even sure I had going on. She made me recognize my grief, not only from losing my family members but also the grief I was carrying after my breakup. But what is grief? I really had no idea either until Sherry shared with my her own experiences and made me recognize that this process and idea of grief is different for all us yet. Sometimes it takes someone else, another point of view, to open your eyes to exactly how those things are affecting you personally. By facing grief and addressing that it is indeed what is weighing you down. I believe a large part of this is recognizing in the first place what exactly it is doing to the body and mind. How would you describe how you feel now? Although I feel my anxiety, grief and overall feelings of sadness and depression come in waves, I feel Sherry gave me the tools to deal with them first hand. And I always know she is there for me if I need a reminder of those things. When is the last time you were graded? Do you remember what it felt like to get an “A” on work that you handed in? Can you still feel what it felt like or would have felt like to receive such a prestigious mark in school? 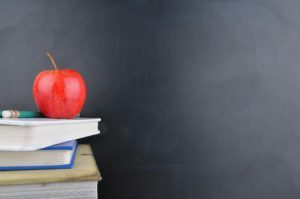 Things have changed a lot since I’ve been in the classroom and letter grades are not as commonplace as they once were. However, the significance of getting the Grade “A” still lives on. 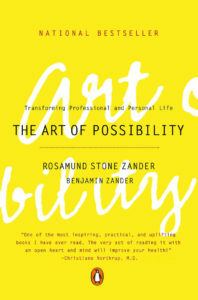 In this book “The Art of Possibility“, Benjamin Zander shares how he would start each term by giving his students a blank piece of paper, on which the student was to write themselves a letter about how they successfully received an “A” in the class. He shares stories from his student’s immensely positive experience doing so, and how impactful that exercise was in their success. How do “A” students differ? What would your answer be to that question? We all will have pre-conceived ideas and beliefs about what makes an A student. We all would have thoughts on how they act and how they spend their time, how they approach the subject, how they prepare for the class and we all would have our own idea about what it would both feel like and mean to them to get that A. Why would this make a difference? Essentially it is scripting the outcome. Writing the letter is done by each student and just as any goal that you wish to achieve there is more power, connection and intention when we write it out in our own words. 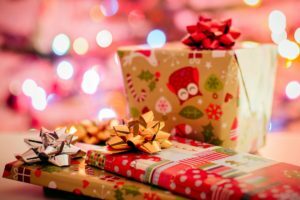 Without effort we would already have conjured up the feeling of getting the “A”, because the letter is written from a place of having received it already. How does it work outside of a classroom? Just as above if there is a goal you wish to accomplish my go to invitation to people is to write it out as if it has already happened. Using all the feels that you can include to describe and express the success. When we can foresee and visualize ourselves achieving our goal we benefit from using all of our senses to describe the experience. What did it feel like the moment it happened, who was there with you, or who did you tell first (describe the phone call or text or other means you used to deliver the news), where were you when it came to be, what were you wearing, what were you feeling, what were the smells you smelled and so on. How would you differ? 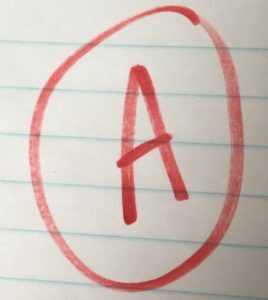 If you knew through and through that you were going to get the coveted “A” for achieving your goal, how would you spend your time, how would you approach your goal, how would you prepare, how would you act? If you knew that getting the “A” was a sure thing, would you coast? Or would you show up as an “A” student? and do the work, put in the time, while anticipating the reward? Do you think its possible that a teacher who empowers their students to give themselves an “A” may also show up differently in the class? How different would their experience teaching be if each person in their classroom were sure thing “A” students. In turn they would act, approach, prepare, and so on accordingly and in sync with their audience. What a powerful combination that would be! The teacher sees each and every one of those pupils as successful, because he too has likely written a letter to himself for the end of term about how he had a classroom full of “A”s as well! How would giving yourself an “A” add value and vibeage to the goals you wish to achieve? Since June 29th, I’ve traveled over 5000 kilometers or 3100 ish miles, and consumed 8 audio books while on the road. Ironically, I had just been telling people how little I drive now, how infrequent I have to fill up my vehicle, then well the road trips happened. It all started by taking a trip on the “Going to the Sun Road” through Glacier National Park in Montana. If you ever get a chance to make that trip I HIGHLY recommend it. Your eyes will strain to be wide enough trying to process the views. Your mind will be blown by both the views and the dizzying heights. Your nose will explode with the intense smell of pine. And you may white knuckle and clench a bit (or a lot) at the turns and proximity to the edge. Suffice to say awestruck only begins to describe the trip. A few days after we got home I set off solo to support a VIP to me and it was on that trip that I really tucked into the books I had in the queue, I predominately listen to business, self development, mindset, and books about the brain and here are some highlights . I listened to a book which was narrated by the author and he was FIRED UP about setting goals 10X the size you normally do, contrarily I listened to a book which invites you to make Mini Habits in order to make big changes. I learned that out of the 10,000 bits of information our brain processes a second, of which only 50 bits is conscious. WHAT THE WHAT?? Here is a visual: imagine a cup of white sugar holds the number of bits our brains process per second, 10 grains of that cup is conscious. I’m still working on processing this concept. Regardless, this information added further depth to a book about Mindless Eating. I had a number of perspective shifts not to mention a bunch of LOL’s while listening to The Subtle Art of Not Giving a F**k. (FYI the book is plump with language as indicated by the title). And I learned from and refreshed some possibility shifters from the Zander’s in The Art of Possibility. I won’t get into any depth of the specific take away’s and bookmarks I’ve made in any of those books, (may save that for another time) because for all that I learned from these authors and their expertise, and I learned a lot… the biggest thing that resonated with me was hearing something a Mom of 3 littles said in response to hearing my plans for the following morning. 3. Stop in for a browse at a store in the mall. Her friend who was trying to do stuff in the kitchen amid a stream of chaos consisting of: two one year olds, a couple or was it three 4 year olds, and a dog commented, “I want your life“. On the drive away back to my hotel that comment really stuck and like a pebble in a still pond it created a ripple. What a gift it is to get outside eyes on something you see all the time? Its taking what is your normal for granted. Its taking the everyday, the everybody, the everything we see, do, have etc in stride without a second glance. And you know what, I concur with her observation. I too, want my life. Every Single Second of it. I am Living the Story I want to tell. Because my life would look and feel a lot different if I allowed my story to own me. And at times I’ve given it permission to do just that. Those why me times, those times when I didn’t believe that life was happening for me not to me times. 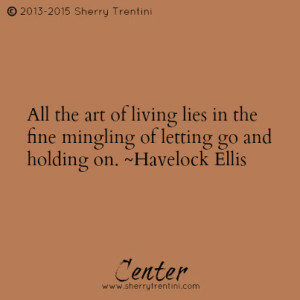 Therein lies the nuance of the story that I’m living and telling & your story that you are living and telling. Its part of our life. Its the contraction part, the tears part, the twisty bits that we can’t make sense of in the moment and we recede. Then comes the expansion part. We stand up and own each and every bit of it. Owning it. Claiming it. Learning from it. No regrets. The tea cup I found on the very same trip reminds me to continue to own it. To live it. To create it. Hmmmm……What shall I create in my story next? 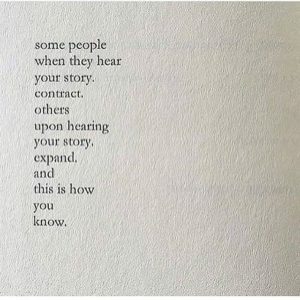 What part of your story is owning you? What is your Life Reclamation Project? 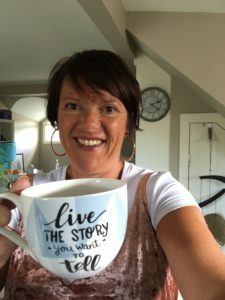 What is taking energy away from you owning your story fully? It is possible that we hold onto life experiences that do not support us truly owning our past story, which in turn can impede us in moving into our future story. I’d love the chance to have a chat with you to hear what it is you would like to reclaim and build on for your future. Click HERE to book your most perfect time. I’ve been working on a 13″ laptop for 2 years now, the technology is brilliant however the position I have to assume in order to type this blog article or anything has become progressively more detrimental to my body. My personal trainer, my chiropractor, my body guru have all wagged their fingers at me to make a change to support my posture. So I bought a proper chair, which helped a lot but didn’t fix it because I still had to turtle my neck in order to work on the laptop. Posture and alignment of the body is not new information for me. I used to be the one preaching to the choir (clients) after all. “I’m fine” or that “I’ll be fine”. How many times have you answered with an “I’m fine” when you are not? That response is probably the most common lie that we tell ourselves and others. It is the conversation killer, because you can’t argue with ‘I’m fine”. They said they were fine, so we accept that lie and move onto another topic. “I’m fine” is a blanket response that intimates that we are not going to talk about how we are really feeling. It is a generally accepted response to almost any experience. Yet we are lying, more often than not. Granted, there are times and situations when you are asked how you are that it wouldn’t be appropriate to answer honestly as it would be oversharing and the asker is asking out of common courtesy and isn’t inquiring for or wanting the deeper answer. So we can get away with it. I don’t have figures to back this up, but I’ll guess that 90% of the time we get away with telling others that we are fine without any recourse. The recourse comes in the backdoor. We say something enough, create a belief and whammo we have an unconscious mantra that we are fine, when we are not. Lying to ourselves is the most harmful, because I think it is possible that we may then stop looking for ways to actually be and feel fine, like truly fine and not the fake kind. I stopped listening, because it had become normal for me to pick up the phone and get help, a bandaid of sorts, but I’d get patched up and be back some times sooner than later for another fix. I had stopped listening. I heard myself say it a million times that “I’m fine” and I stopped hearing the truth, stopped hearing the call to action to do something beyond getting adjusted. Until I stopped saying it. And tolerating what being fake fine was for me. Two weeks ago today, (after I had endured 3 weeks of daily headaches I might add) I went out bought a 27″ monitor, a proper keyboard and mouse. 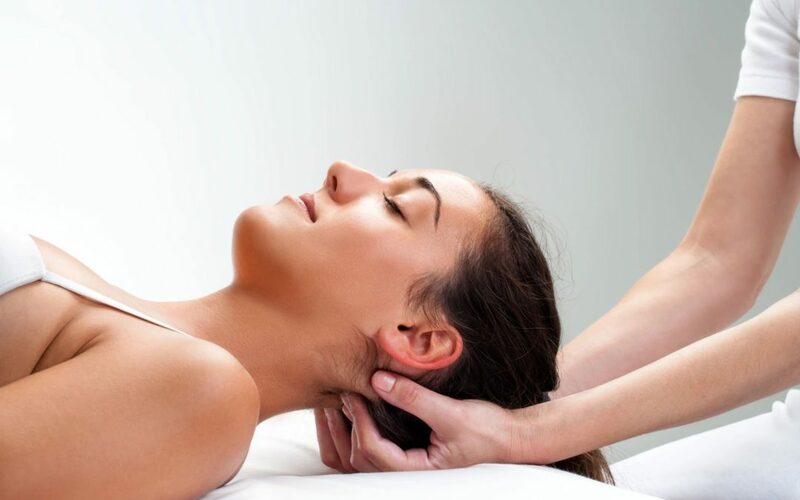 The cost of which was nominal in comparison to what I have spent on massage, chiropractic and other modalities in the time period. Heck I have been saying ” I really should…go out and buy a big monitor etc” but should is just code for I don’t want to, because I was fine after all. I can not tell you the difference it has made for me. I can not tell you the difference in my wellness overall not to feel impinged, not to be awoken in the night with a headache and so on. This was a relatively easy fix to my, “I’m fine”, but there are layers to those 2 little words and they can run deep and twisty.